The Book of Mormon is a rich resource of stories of faithful people who believed in the Savior, Jesus Christ. Featured here are works of three Latter-day Saint artists who have drawn upon some of these stories as the subject for their artwork. Their artwork was part of the Fifth International Art Competition sponsored by the Museum of Church History and Art. The Guardians of the Hearth (Merit Award), Eileen N. Whitaker, Sunset Heights Sixth Ward, Orem Utah Sunset Heights Stake, Victorian stitchery, 44″ x 29 1/2″. They Did Carry with Them Swarms of Honeybees and Seeds of Every Kind, Emma Allebes, Fair Oaks Fourth Ward, Sacramento California Fair Oaks Stake, appliqué quilt, 56″ x 81″. Our Liahona in Our Lives, Lourdes D. Samson, Pilar Branch, Orion Philippines District, embroidery, 22 1/2″ x 27 1/2″. 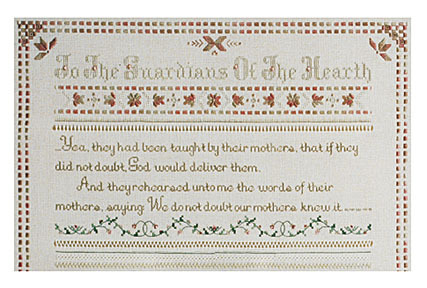 Sister Whitaker has captured a message of inspiration and hope for today’s mothers, the “Guardians of the Hearth,” in this Victorian stitchery. She used two powerful scriptures wherein the sons of Helaman expressed faith in their mother’s teachings (see Alma 56:47–48; Alma 57:21), then added the words of a blessing from President Gordon B. Hinckley speaking at the general Relief Society meeting on 23 September 1995. 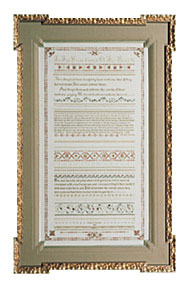 At this meeting, “The Family: A Proclamation to the World” was presented. 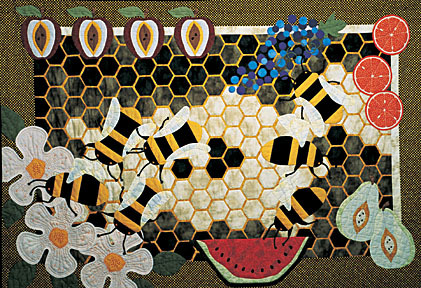 As Sister Allebes was reading of the Jaredite migration in Ether 2:3, she came upon the idea to do a quilt with a honeybee, fruit, and flower theme. She started with the honeycomb background and hand appliquéd 231 4-inch hexagons to a gold 100-percent cotton fabric. Then she added the blossoms, honeybees, and fruits by hand appliqué. Beadwork and folk-style quilting completed the quilt. Heavenly Father provided a “compass” for Lehi and his family to journey through the wilderness and to the promised land when He gave them a “round ball of curious workmanship” (1 Ne. 16:10) called the Liahona. “Pointers which were in the ball … did work according to the faith and diligence and heed” (1 Ne. 16:28) of the family. 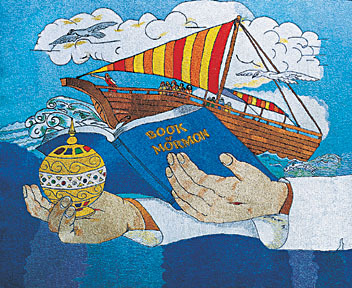 Sister Samson wanted to remind us that we have a similar “compass” today﻿—the Book of Mormon﻿—that can help us find our way back to our Heavenly Father. If we will live by its precepts and teachings, it will surely guide our lives.